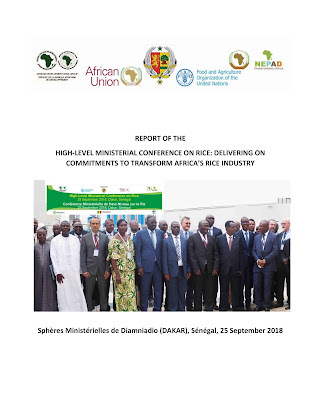 This document presents the report of the High-Level African Ministerial Conference on Rice held in Diamniadio, Senegal, on 25 September 2018, with the objective of generating a more collective policy direction and support for enhancing the implementation of investment programs geared towards the attainment of rice self-sufficiency in African countries and the creation of gainful employment for the youth and women along the entire rice value chain. The Conference offered an excellent opportunity to the participants to highlight the needed technical expertise, technologies, investment prospects including private sector investments and the role of different actors required to reach the goal of rice self-sufficiency in Africa and significantly reduce the risk of food crises. The Conference focused on the priority areas resulting from modelling of investment requirements of the Continental Investment Plan for Accelerating Rice Self-Sufficiency in Africa (CIPRiSSA), completed for 10 countries. The areas needing increased investments were i) rice seed systems and associated farm inputs, ii) out-scaling of rice technologies and innovations and iii) small-scale mechanization. The report contains Conference recommendations, list of participants (Annex A), and the Conference agenda (Annex B).